While using the latest version of the Gmail app: 6.3.117716127, I cannot sync my mail whatsoever. Update: 6.4.120760496 has the same issue. Tapping "Sign in" just makes the message at the bottom go away, but nothing else happens, and it doesn't sync. If I try refreshing my inbox, it will bring that sign-in message back. My last sync with the newest version was April 13th. Then I reverted back to an older version of Gmail from November of 2015. That version syncs just fine. You can see email from April 19 in the screenshot, because I tried upgrading back to the latest version, but it still wouldn't sync. Deleting the cache and data doesn't help. I did not change my Google password. Browse other questions tagged sync gmail or ask your own question. How to sync an Android phone with anything other than Google? “Local calendar cannot sync with Google calendar…” but it can? What? Why does Android GMail app pop an icon for new mail when I delete a message in web GMail? Firm Gmail, i.e. 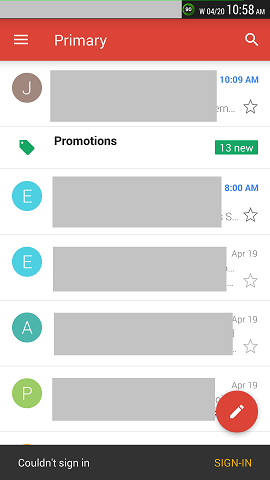 Google Apps -email, with K9 -email program?